There’s no time like the holidays to enjoy some great activities around the Pikes Peak Region, especially while staying at Holden House 1902 Bed & Breakfast Inn, just a few minutes from downtown, historic Old Colorado City and Manitou Springs. Here are just a few of the upcoming area events you’ll want to attend as we “ring” in the Season! Old Colorado City’s ArtWalk featuring hundreds of artists for the 9th year along W. Colorado Avenue, for a special Holiday Celebration. Hundreds of art pieces may be viewed for purchase in dozens of art galleries and studios. Colorado Springs’ largest concentration of galleries is found within three city blocks along West Colorado Avenue, between 23rd and 27th Streets. 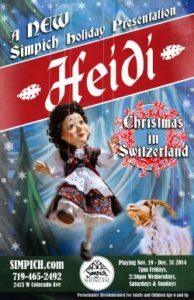 HEIDI performed by Simpich Marionettes November 19-December 31, 2014 – Utilizing a new and remarkably unusual staging concept, puppeteer David Simpich brings to the 2014 Holiday Season a brand new adaptation of Johanna Spyri’s beloved novel, Heidi. 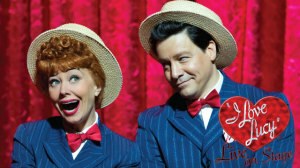 The play will be performed throughout the season in the Simpich Theatre. Near the modest hut of the “Alm Uncle” nestled below the snowy Swiss Alps, the adventures of a young girl named Heidi begin. HOLIDAY MURDER MYSTERY December 10 – Antler’s Holiday Party, featuring the premiere of the “Ghosts of Little London” , a murder mystery performed by Red Herring Productions. A perfect holiday event for family, busineses or friends looking to get together and celebrate in a big way. Ticket price includes the Antler’s Holiday Buffet, by the award winning executive chef and team, interactive murder mystery, and is inclusive of service charge and tax. This entry was posted in holiday and tagged Artwalk, Colorado Springs holiday events, holden house bed and breakfast holiday events, Holiday Gala in Old Colorado City, I Love Lucy, murder mystery colorado springs, peakradar, PIkes Peak Center by admin. Bookmark the permalink.